Get a glimpse of what Lapland has to offer. Enjoy two days with unique and exciting activities and spend the nights in remote wilderness cabins, with no running water, but candle light and a wood heated sauna. Experience the faster and more modern way to travel on the snowmobile and in comparison the calm and quiet way on the dogsled! Day 1: At 13.00 pm. we pick you up from the airport or your hotel in Kiruna and take you to our homebase (about 15 minutes drive). Here we provide additional winter clothing (overall, winterboots, hat, mittens). 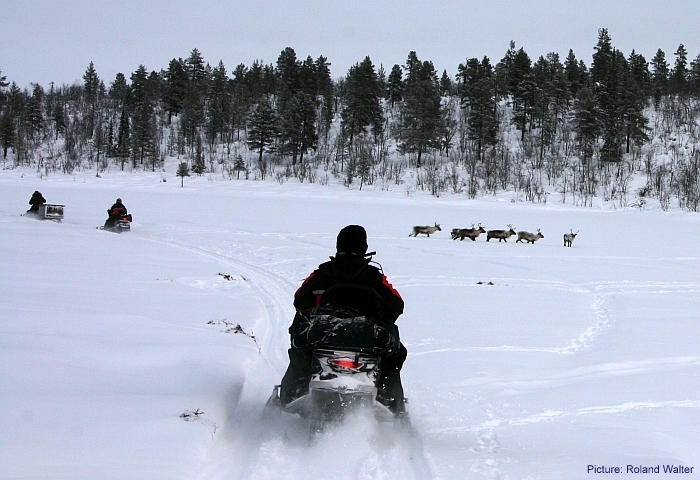 After an introduction in "how to drive a snowmobile" you take off for by snowmobile towards our wilderness camps. Two participants share one machine, if you would prefer to drive our own snowmobile it is available against an additional charge. Sauna, dinner and overnight in the camp. Day 2: After breakfast we pack our stuff and hit the trail again by snowmobile towards our homebase, where lunch will be waiting for you. After lunch you get an introduction into driving a dogsled and "mush" your own team of 4 dogs out to the wilderness again. Day 3: After breakfast we drive our dogteams back to the homebase, where we again arrive around late lunchtime. If your time schedule allows you, it is possible to visit the famous Icehotel or a little Sami museum in Jukkasjärvi, a village just 6 km away from our homebase. Afterwards, transfer back to the airport / train station and departure. General information: To be allowed to drive a snowmobile, a valid car or motorbike drivers licence is needed. The extra charge for driving an own snowmobile is 1.000 SEK. In case of damage we have an excess fee from up to 6.000 SEK!